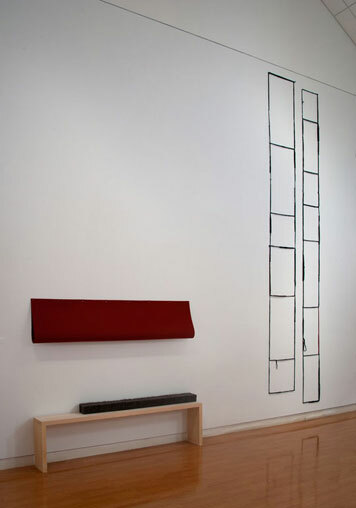 20" x 56" x 2" and 30" x 50" x 2"
Marcie Miller Gross, In Memory (2 slabs), 2017. In Memory (2 slabs) - detail. 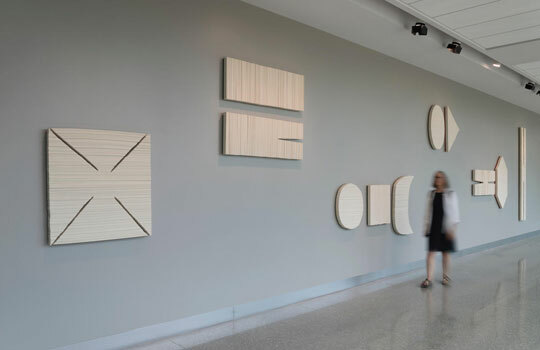 (18) wall sculptures, sizes vary; installed in the Health Education Building, University of Kansas Medical Center, Kansas City, Kansas. Marcie Miller Gross, Des Emplastres et Des Compresses, 2017. Des Emplastres et Des Compresses - detail. Sizes vary, overall: 144" x 20" x 12"
Marcie Miller Gross, Moss (multiples), 2016. 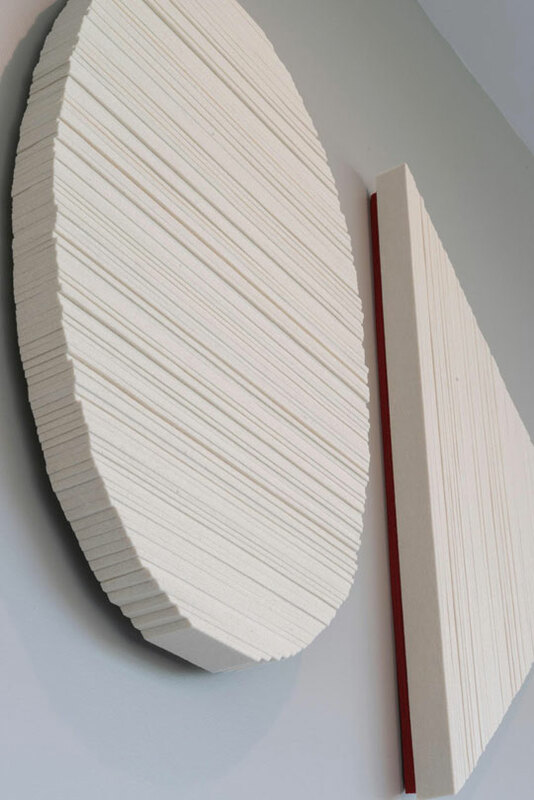 "Within my site responsive objects, installations and drawings, I am fascinated with the interplay between the spatial, conceptual and architectonic conditions of a place. 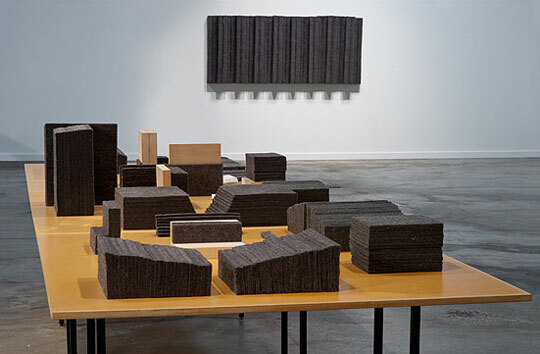 Through an incremental means of building with utilitarian materials, industrial felt, wood, paper towels, felted wool sweaters, I make objects that explore serial, repetition, mass and void, physicality and weight, compression and release. Within these qualities, I find parallels in the physical and psychological states of the body, and sensory knowledge. 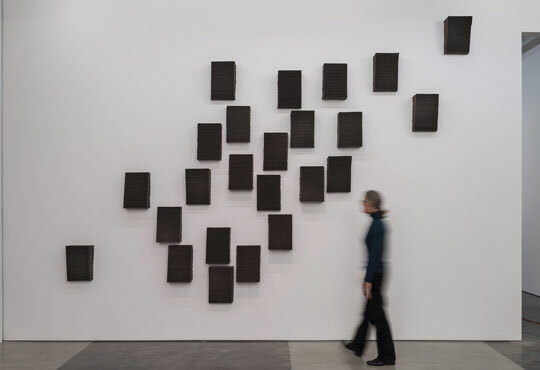 These pliable materials have an intense relationship to the body, and the capacity to carry traces, memory and a potent history of former use. 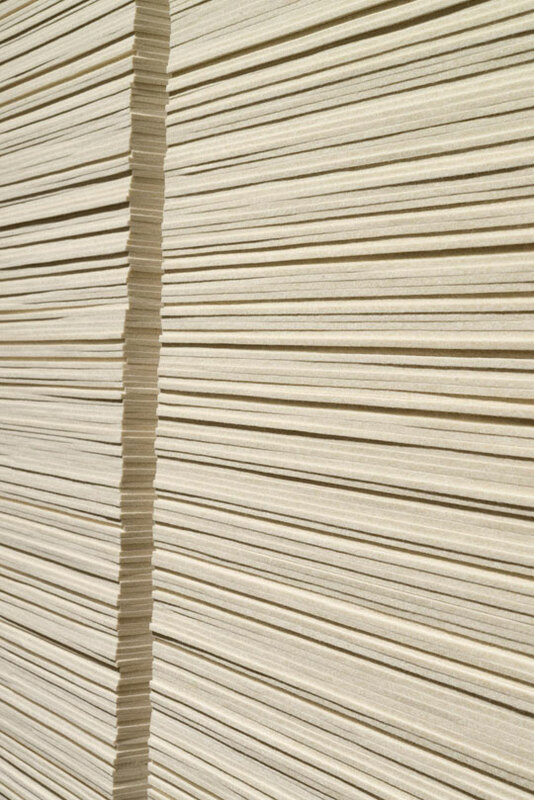 My interest in physical actions of folding, cutting and stacking finds its focus in organization and reduction and makes reference to artistic precedent such as mono-ha and minimalism. 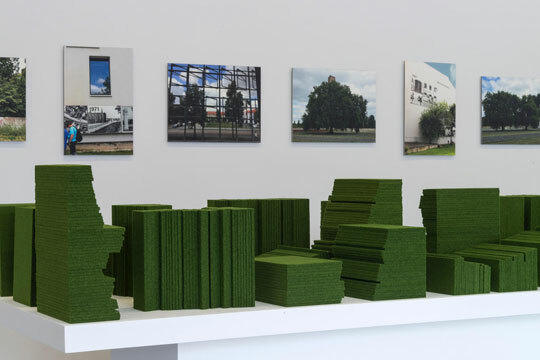 These elemental solids are informed by systems of nature and geometry, Froebel's gifts and German modernism, animal and mineral, parts and arrangements, architectural fragments, wedges, blocks, slabs." 10 ½" x 17" x 5" each, 14' x 20' overall. 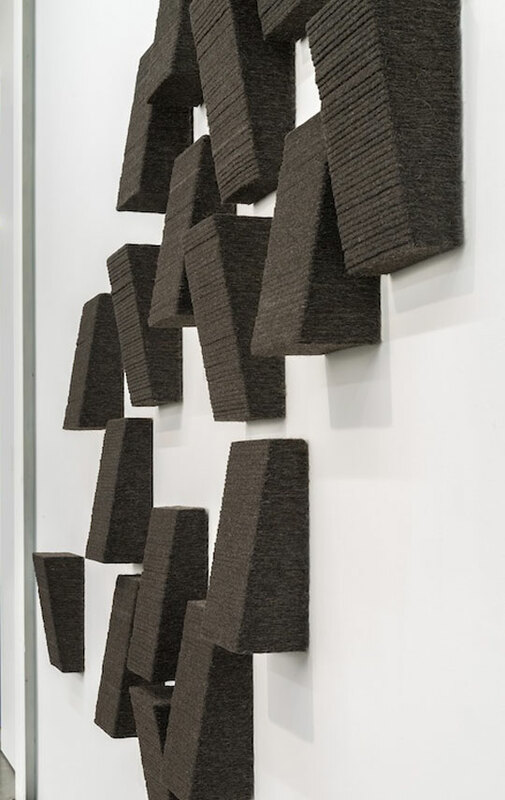 Marcie Miller Gross, Wedge (24), 2013. 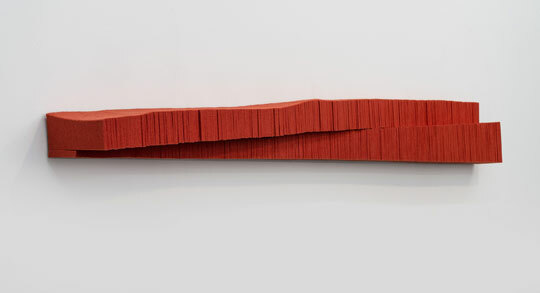 9 ¼" x 83 ¾" x 6"
Marcie Miller Gross, Orange (split), 2013. Felted wool seater seams, pins. 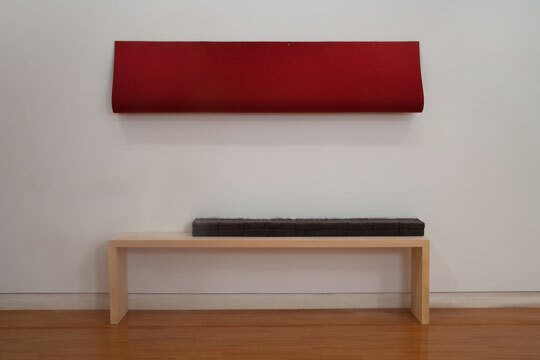 Marcie Miller Gross, Red Fold, and Untitled (seams), 2012. 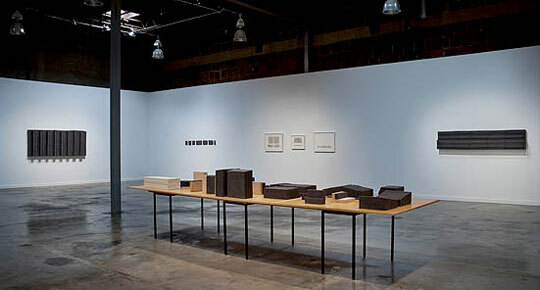 Marcie Miller Gross, Concentrations, installation view, 2011. 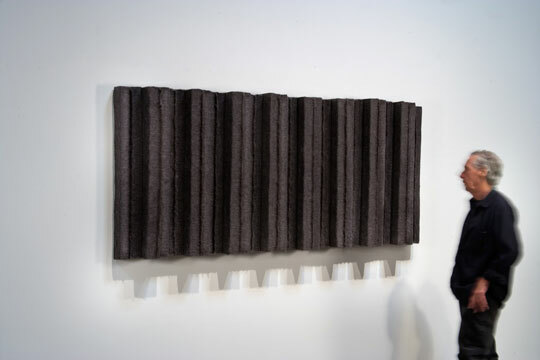 50" x 173" x 29"
Industrial felt, basswood, found wood, mdf, steel. 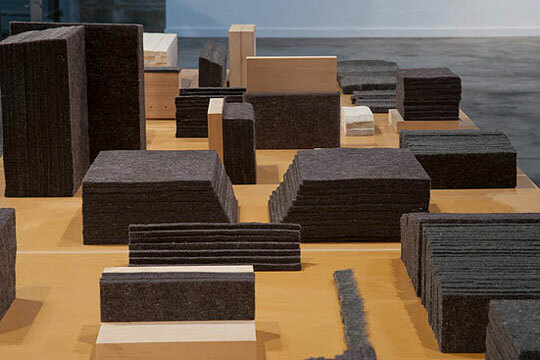 Marcie Miller Gross, Working Parts (wedges, blocks, slabs) and Sheared #1, 2011. Working Parts (wedges, blocks, slabs) - detail. 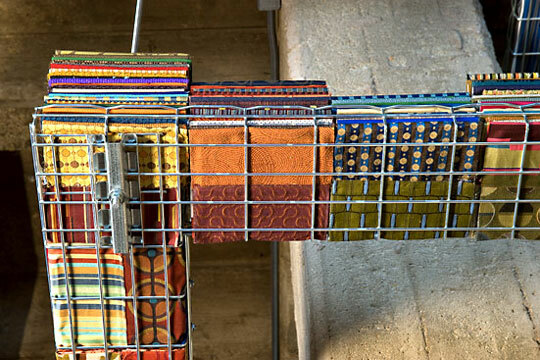 Discontinued fabric memo samples collected from architectural and design firms, electrical cable tray, glue. Commission for the American Institute of Architects, Kansas City, Missouri, "Art Through Architecture Program". 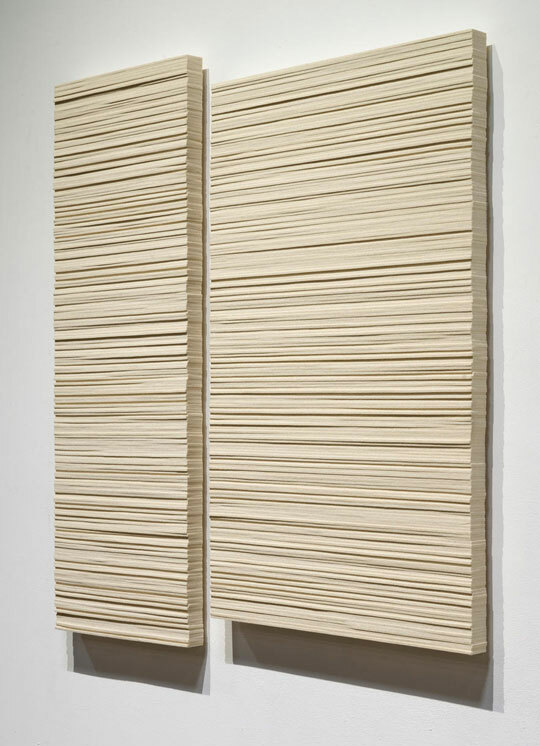 Marcie Miller Gross, Recirculate, 2010. 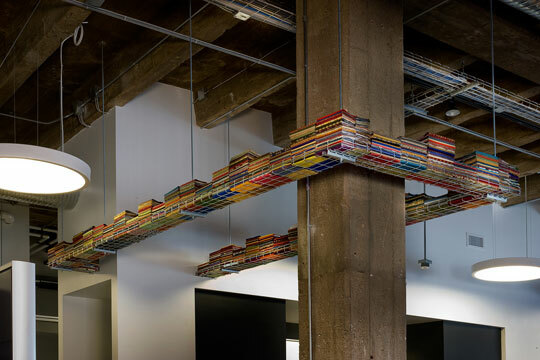 Marcie Miller Gross, Urban Strata, 1993.